Op-ed submitted to Boston Globe after Patriots’ Superbowl LI win. Pity they didn’t take it, but here it is anyway. The message that it contains is rather important; like footballers, politicians need to adapt quickly to circumstances! 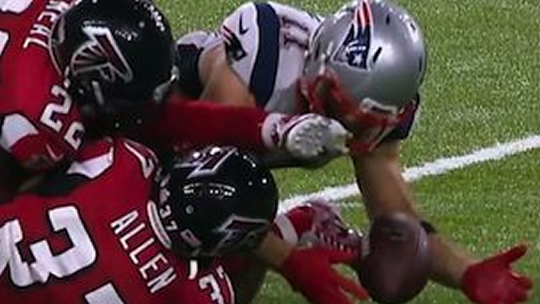 When wide receiver Julian Edelman stuck out a hand and took that catch inches from the ground in Superbowl LI, he tipped the balance of the game dramatically. The Patriots had been flexible. They had changed their strategy in response to circumstances, and their resilience paid off. Flexibility and resilience are key factors when it comes to success in football. They are equally important when it comes to the success of societies. In our modern, interconnected, interdependent world, societies need to be able to change their game plans in response to changing circumstances. A diverse and vibrant community, such as is provided by encouraging immigrants from different cultures, provides a firm foundation for this flexible approach to community decision-making. The United States has a long and proud history in this regard. Through encouraging the immigration of people whose own societies have let them down or failed to support them, it has gained greatly. Just to take an example from my own field, all six of last year’s U.S. Nobel Prize winners in science were immigrants. It was one of those immigrants who uncovered an unsuspected hole in the U.S. constitution – one that allowed for the emergence of a dictator. The immigrant was the Austrian logician Kurt Gödel, who had already uncovered an abyss in the foundations of mathematics. Now, an escapee from Nazi persecution, he wished to settle and work in the United States. With such a pedigree, and with fellow immigrant Albert Einstein as his sponsor, you would have thought that there would be no problem. As part of his preparation for his citizenship examination on December 5th, 1947, Gödel decided that it was his duty to make a thorough study of the U.S. Constitution. He found to his horror that the Constitution fulfilled most of the requirements for democratic fairness, but that it actually allowed under some circumstances for the election of a dictator. Gödel was already suffering from the paranoia that would plague his later life, and felt that he really couldn’t let this pass. During his examination, the judge asked him if he thought that a Nazi regime like the one from which he had recently escaped could happen in the United States. Gödel excitedly began to expound his discovery, and to criticize the whole logical formulation of the Constitution, much to the concern of Einstein. Luckily, the judge was a man of sense, and cut Gödel off before he could dig too deep a pit for himself. But it seems that the pit is still there. Certainly the executive orders with which Donald Trump has begun his presidency have been dictatorial in nature, and it seems that this will continue. But this is not the real problem. The problem is their absolute nature, and the lack of flexibility with changing circumstances. H.L.Mencken, the sage of Baltimore, hit the nail on the head when he said that “there is always a well-known solution to every human problem – neat, plausible, and wrong.” President Trump’s solutions are neat. To his supporters, they are plausible. But no account has been taken of the fact that they may be wrong. In our tightly interconnected world, a small event in one place – the sticking out of shin in a football game (watch the replay! ), the damming of a river upstream from agricultural land, or the blocking of immigrant visas – all of these can have large and unpredictable consequences down the track. Simplistic policies and rigid approaches may have an immediate effect, but experience has shown that they are unlikely to offer stable long-term solutions. Instead of attempting to block change, governments need to learn how to cope with change in our complex world through accepting its inevitability. They need to plan for resilience instead of restriction; for diversity instead of a social monoculture; for flexibility when it becomes obvious that a policy was misguided. Donald Trump is following none of these guidelines. If the New England Patriots had been so inflexible, they would surely have lost. By being flexible and resilient, they won through – and so can society. Football indeed offers some valuable lessons.